Please see the calendar below for our upcoming dances. 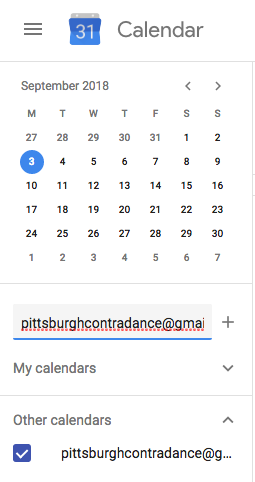 If you would like to sync calendar to your Google Calendar (or another calendar), search pittsburghcontradance@gmail.com as shown on the right. The calendar events show where the dance is being held, as we dance in different locations. Our main locations are BMNECC (451 W 8th Ave, West Homestead, PA 15120) and the Wightman School (5604 Solway St, Pittsburgh, PA 15217). For addresses, directions, and which buses to take, see the Directions Page! There are occasionally other contras in the Pittsburgh area, listed on the calendar below.